Popular manga cartooning duo Fujiko Fujio had a series of successes in the 1960s with their kid-friendly comics. “Q-Taro the Ghost” proved to be a huge hit when it debuted in 1964, which lead to an anime series and numerous merchandise. However, even though the two creators, Hiroshi Fujimoto and Motoo Abiko, remained partners and shared the joint pseudonym until 1987, they mostly started working on their own work after the first “Q-Taro” manga ended. 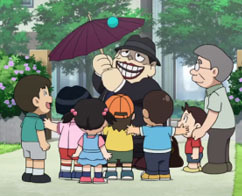 Fujimoto, who would eventually become known as Fujiko F. Fujio, mostly concentrated on children’s comics, most notably “Doraemon”. 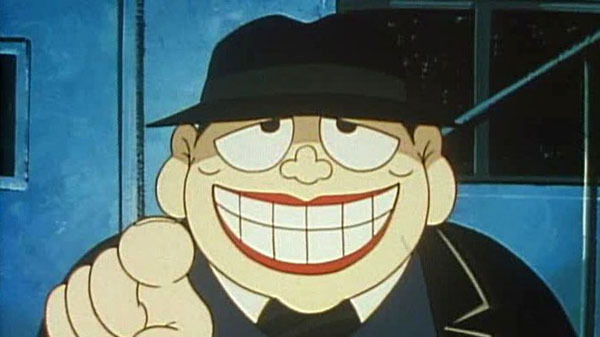 While Abiko, aka Fujiko Fujio A, did some kid-friendly comics like “Hattori the Ninja” and “Kaibutsu Kun”, he started focusing on creating content for more mature audience, creating comics with more horror and black comedy elements. One of his first successes in the black comedy genre was “The Laughing Salesman”. 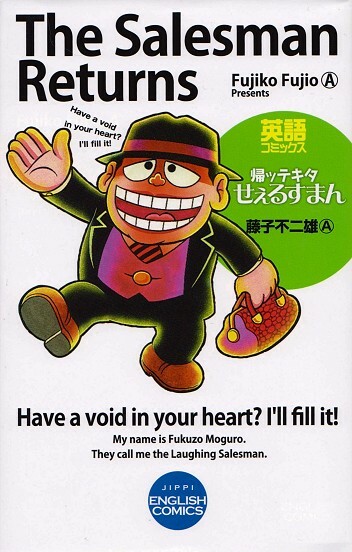 The title refers to Moguro Fukuzo, a creepy salesman who offers to people who feel a void in their hearts a chance to fulfill their dreams and fantasies, only for their greed to get the better of them. Each episode ends with Moguro’s clients facing ironic punishment in a darkly hilarious way, usually due to the person losing their mind the more they indulge their fantasies. The central theme, as one can attest, is “be careful what you wish for”. Moguro Fukuzo seemingly grants a person’s wish, but they always come at a stark cost in their well being. One episode, as a example, features a man struggling to pass a driving exam due to his poor skills. Moguro offers to teach him how to drive by letting him do however he wants with it. He wrecks the car, but enjoyed it so much (and because Moguro pushed him), that he starts getting more and more reckless, which culminated with him stealing a truck and going on a rampage, crashing into a Love Hotel. 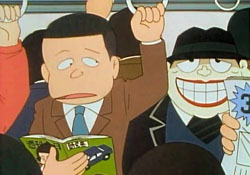 The comic first appeared as a one-shot piece in Shogakukan’s Big Comic magazine in 1968. From 1969 to 1971 it appeared in Manga Sunday magazine, published by Jitsugyo no Nihon Sha. An anime was later made, airing for three seasons from October 19, 1989 to September 29, 1992, running for 103 ten-minute episodes and 9 TV specials. The series was produced by Shin’Ei Doga, and was broadcast on TBS as a segment on a variety program “Gimme a Break”, which aired on Tuesday evenings at 9PM. This marked the first time a Fujiko Fujio anime aired on TBS since “Umeboshi Denka” in 1969, 20 years prior. A second anime was made for late night broadcast on 2017, entitled “The Laighing Salesman NEW”. Also produced by Shin’Ei Doga (with animation production contracted out to TMS Entertainment), the series was a more modern take on the series, with episodes focusing on black corporations (which has become a major issue in Japan) and internet trolls. 12 half-hours, each with two segments, were made for this run. English version of the series is limited. A bilingual (English and Japanese) version of the comic has been released as “The Salesman Returns”. The 2017 anime was also distributed with English subtitles through the Crunchyroll anime streaming service. The series remains popular with fans, and it put Fujiko Fujio A on the map with more adult content. Book collections continue to be sold, and there are fans who enjoy the anime. An episode of the 2017 revival, with English subtitles. 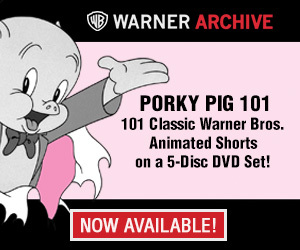 I can’t help but think his design looks partly inspired by Peter Lorre. That’s a creepy “Boris” if you ask me! 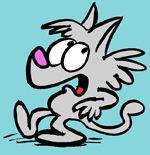 The character reminds me of Asbury Park’s former (but not forgotten) mascot Tillie. The salesman reminds me of Peter Lorre!